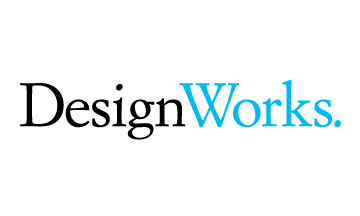 The Denver Art Museum’s Collectors’ Choice is a fundraising gala that art enthusiasts, museum goers, and designers at DW alike look forward to each year! There is always a theme for the black tie affair and 2013 was the year of “Upscale Western” which won the spotlight and admiration by many. Check out some of our favorite design moments at the museum in today’s DesignWorks Event Highlight! 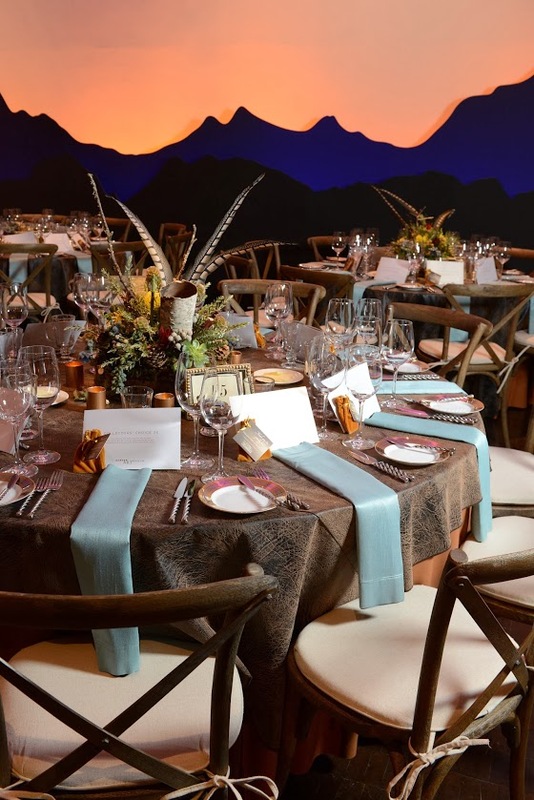 Ponti Hall was lined by mountain silhouettes inspired by the Colorado Rocky Mountain range with many shades of beauty though lighting provided by Fastlane Productions. Manzenita branches hung from the dramatic tall ceiling adding the western element to all angles of the event. Guest tables were dressed in a distressed leather linen complemented by a waterfall folded Dupionique Azure Napkins. DW’s rustic cross back chairs added to the ambiance while western inspired centerpieces took center stage at each table pulling the entire look together. 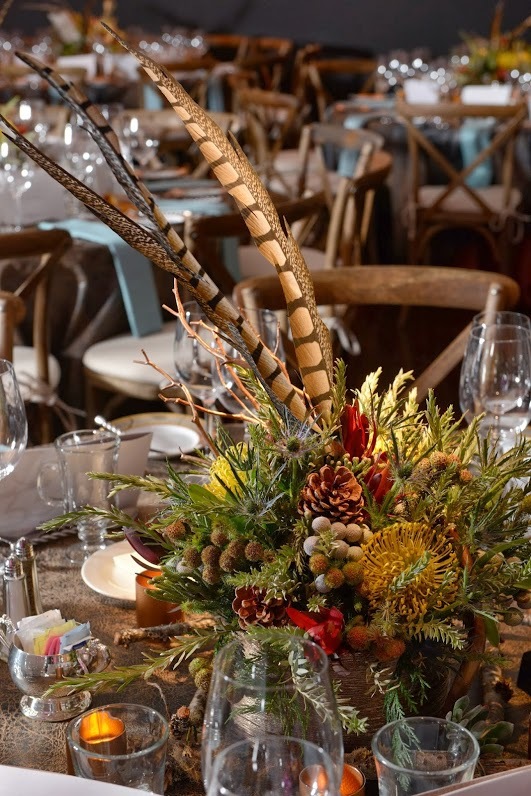 This guest table centerpiece styled yellow Pin Cushion Proteas, Pinecones, Faux Feathers, and Brazilian and Silver Berries. The piece was softly illuminated by glowing copper votives transporting guests to the fabulous and fun Wild West. 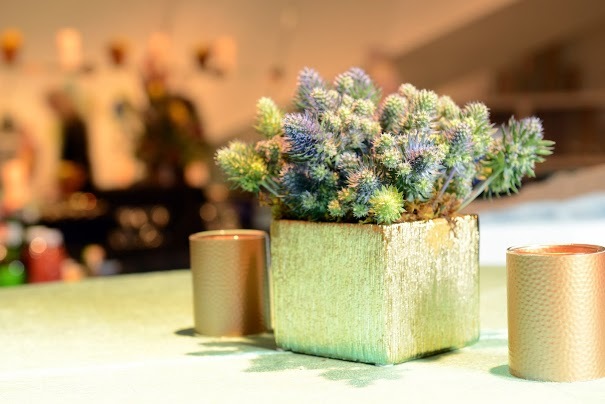 Accents of Blue Thistle in gold and copper vessels hammered in different textures were spread throughout the venue furthering the rustic and chic elements of the evening. Fun fact: Although you see at least two shades of thistle in this piece, they are all indeed Blue Thistle. Premature Blue Thistle is green while at its fully matured state, blossoms into a vibrant blue. 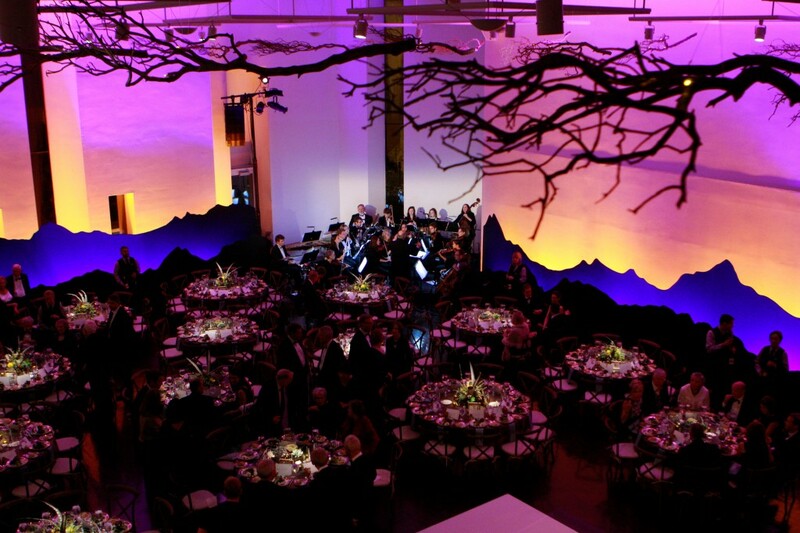 We at DW cannot wait until the next Collectors’ Choice Gala with a new fabulous theme, fresh creative ideas, and as always, one of our favorite venue canvases to paint on- Ponti Hall of the Denver Art Museum. Until next time, happy designing DW fans!